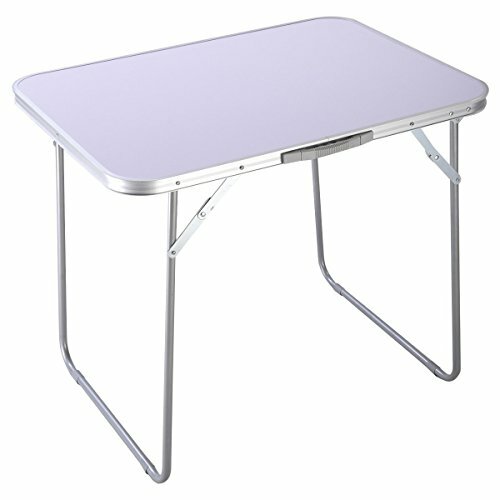 Thisis our Portable camping table, which is ideal for family reunions, picnics,camping trips, buffets or barbecues. The table is of MDF + aluminum table top and steel legs. So it resists spills and weather and sturdy easy to clean. Becauseof its foldable legs, it can saves space and time as well as convenient to transport and store. Buy it, enjoy your family reunions, picnics, campingtrips, buffets or barbecues! 【Lockable and Foldable Leg】 Foldable leg with lockable part and one handle on one side. It could make the table more sturdy and solid, it can saves space and time as well as convenient to transport and store. Portable for picnic and travel. 【Solid Structure】This outdoor table is made by solid mental material with high quality MDF tabletop. Structured with heavy-duty wood for extended durability, and the structure follows the scientific principle and is strong enough to hold different things. It's sturdy and solid for long time and durable usage. 【Multifunction Usage】 This folding fishing table could be used to clean the fish and wild game. It also could be used clean different meats, fruits and vegetables. 【High Quality Top Surface】 The table is of MDF + aluminum table top and steel legs, tough enough to sustain various operation on it, it resists spills and weather and sturdy easy to clean. Spacious tabletop for various snacks and picnic things. 【Perfect Detail Workmanship】High quality iron wire connecting procedure which could make this cage more durable and solid. And the structure follows the scientific principle and is strong enough to hold cats to play.